We carry a wide range of options for replacement soft tops for the 1994-2002 Pontiac Firebird and Trans Am convertibles. No matter what your budget or project requirements, we have a replacement convertible top to suit your needs. This model came from the factory with a two-piece style top. We offer the two pieces separately, meaning that you can buy either the complete top (top with window), the top section only, or the window section only. This way, you only have to replace the part that needs replacing, not the entire top. We also have a budget top by EZ-ON Auto. This top looks like a two-piece top, but it is actually a single piece top with a plastic window. This budget top costs substantially less than the other options, but it is built with the same level of quality and craftsmanship that you have come to expect from our products. 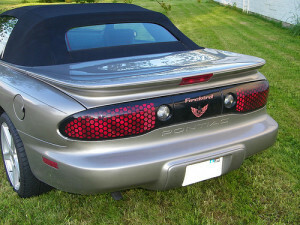 Need a replacement convertible top for a 1994-2002 Firebird or Trans Am? Check out our selection today!